The Radish Store is a family business and we're passionate about everything we do. We love to entertain with BBQs and garden parties, and to go on picnics and daytrips. We wanted to put together a reusable outdoor dining set that was both trendy and durable but found that this was next to impossible. If something was strong, it was ugly. If it was stylish it was either disposable or too delicate to put up with hard use. These colorful melamine plates fit our needs and we think they'll be perfect for you, too. Melamine is tough stuff. You could bang these plates together like rocks and they wouldn't chip or shatter. They can handle the kind of damage that kids can inflict, so you could use them outside on a patio table or indoors for everyday mealtimes without worrying about who's going to drop them where. They're lightweight so they're ideal for picnics, camping, and hiking. If you're going to be carrying everything for a meal in your hamper, you can't afford to carry heavy stoneware plates. You don't want to carry wasteful disposable paper, and really, it would be nice to have something with a little style for serving those special sunset suppers at the campsite. Everyone is busy these days, so when we do get time to ourselves, we deserve to make it outstanding. 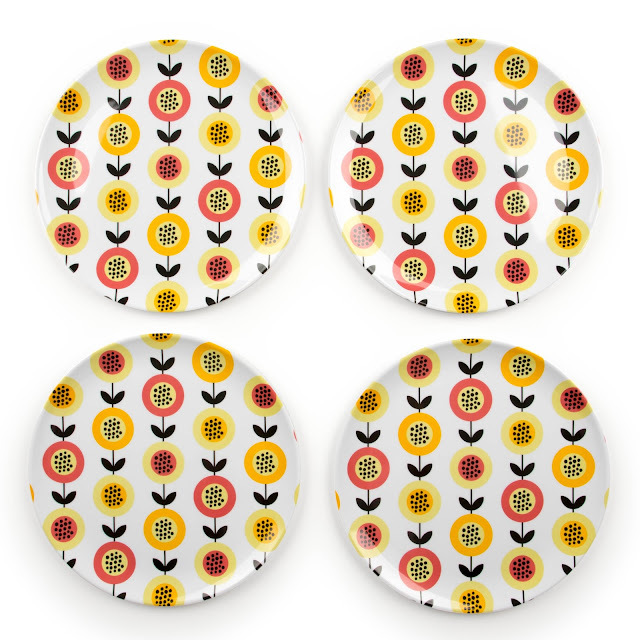 These plates can't guarantee a beautiful sunset, but if you're active out of doors or love al fresco entertaining, well, these plates are perfect for you - fun, stylish, practical and ready to impress any dinner guest! I will start off by saying that I absolutely love these plates. 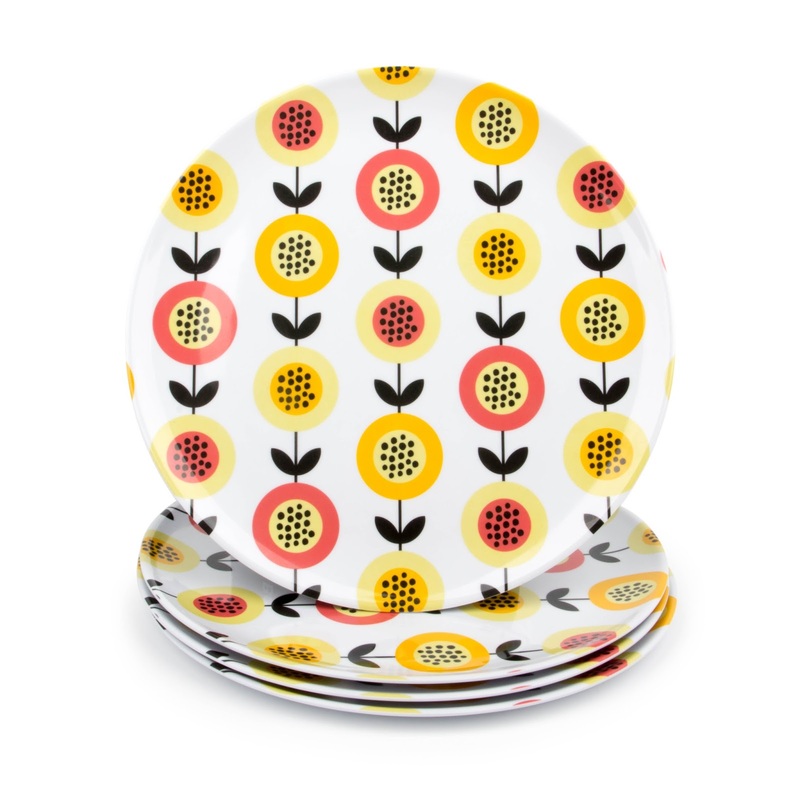 They are fantastic to have, especially in my home where I only had ceramic plates. They could get to be quite heavy when needing more than 1 plate, plus if you drop them, they easily crack or even worse shatter. These plates are very sturdy, yet they are also super light! These would be fantastic to use when eating outdoors or camping. Or if you need plates for the kids that won't break if they are dropped, then these are for you as well! I have been using these exclusively since they arrived at my door, and put all kinds of foods on them. Hot foods, cold foods, and everything in between. I do not use them in the microwave, however they are dishwasher safe. I myself wash by hand, and these clean so easily. Never have a issue with stuck on foods, or anything of the sort. The design of them is beautiful, they almost have a vintage appeal to them. They remind me of the popular designs around the 1950s and 1960s. Overall I really like these, and they are definitely getting plenty of use in my home!